We are currently heading back home from a great two-week vacation! You can be sure that when I get home I'll be scrapbooking many of our adventures, but I also love the idea of creating a mini-album where all the photos, stories and memorabilia from our trip can be stored and shared. This weeks Creative Prompt helps you do just that! The CM August Project of the Month is totally customizable to any trip you have taken - you can use any color 8 x 8 album along with the Destinations Photo Accents to create this little gem! It only takes about an hour to put together the bases for all the pages and then maybe another hour to add your printed photos and journaling. 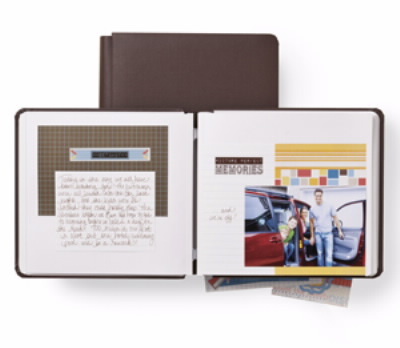 And, if you're organized, you could even make it up ahead of time and bring it with you so you can the journaling as you travel - then just add the photos when you get home! You can download and print the instructions and all the easy-to-follow layouts here! Happy Travels...I'll be home soon!